Hawaii's Jamie Houston dropped the ball in against Idaho last night. While it wasn't totally an AYSO-type night -- only 13 of the 17 Rainbow Wahine saw the court -- No. 15 Hawaii romped for most of it. With junior hitter Jamie Houston putting down 15 kills and sophomore hitter Aneli Cubi-Otineru adding eight, the Wahine needed just 94 minutes to win their 12th consecutive Western Athletic Conference opener via a 30-18, 30-13, 30-27 sweep of Idaho. A Stan Sheriff Center crowd of 4,618 (6,466 tickets) watched as Hawaii (7-3, 1-0) extended its modest WAC win streak to eight heading into tonight's match with Boise State (3-6, 0-1). "It felt good tonight, but there are a lot of areas we still need to work on," said UH senior middle Juliana Sanders, who had five kills with no errors in six swings in two games. "We're getting more serious, not taking any team lightly. "We concentrated on what we needed to do, made sure to take care of what we wanted to take care of. We followed the blocking schemes and adjusted when we had to." Hawaii's focus was on Idaho junior hitter Haley Larsen, the reigning WAC player of the week, who was held to eight kills and .000 hitting. She was coming in off a 35-kill performance last week; last night, Idaho (3-7, 0-1) had 34 kills total. 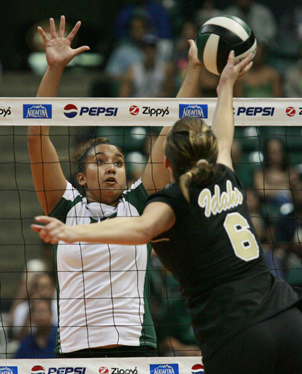 Aneli Cubi-Otineru of Hawaii went up against Debbie Pederson of Idaho during last night's match. At times, the Vandals looked much like the Wahine did a few weeks ago while getting beat up by UCLA. Without Larsen being more successful, Idaho struggled to find offensive consistency. "It's real frustrating," Idaho coach Debbie Buchanan said. "We had a great week of practice, and to come here and take a step back. ... We have a higher standard. "I think Hawaii is similar to us in a lot of ways. They can be error-prone at times and they can dominate at times." How dominating can Hawaii be? Consider Game 2. » The Wahine led 7-0 before the Vandals had a chance to serve, with Stephanie Brandt dropping in two of her five aces in the opening minutes. » Six minutes in, Buchanan had burned both her timeouts. Her team was behind 14-3. » Idaho didn't get out of negative hitting percentage until late, with Larsen's sixth kill bringing her team to 29-13 and .032 hitting. The Wahine hit .467. "They're a better team than they showed tonight," Hawaii coach Dave Shoji said of Idaho. "They looked tentative and we were doing a pretty good job on their best player (Larsen). "I thought our serving was sharp tonight and Stephanie served very well. Tomorrow, we'll see a really good serving team and that will challenge us. We need to continue to work on our passing. Tonight, we started slow in passing and ended slow in passing. In between, we were pretty good." And at times, not as good. 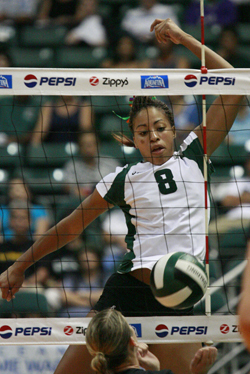 As might be expected, there was a slight letdown in Game 3, with the Wahine again having trouble closing it out. It was 28-23 before the Vandals scored on two Hawaii hitting errors. Idaho held off two match points before Houston put down her final kill to end it. She also had a match-high 13 digs for her sixth double-double of the season. Aces -- Idaho (0). Hawaii (6): Brandt 5, Cubi-Otineru. Assists -- Idaho (31): James 24, Tribley 6, Loney. Hawaii (41): Brandt 37, Hittle 2, Houston, Kaaihue. T -- 1:34 Officials --Eric Asami, Denicse Hanson. A -- 4,618.